The Awkward Niche: A year already? This post is a little late in coming, and it's silly as I have so much to talk about today! The embroidery workshop I ran on the 21st went well and was so much fun! All the ladies were lovely and produced such lovely stitching! It was so funny to see everyone reluctant to stop their stitching on their animals to go back and learn a new stitch on their samplers, because they were so keen to get on and stitch, stitch stitch! This is how I feel all the time so to see this in others, some of whom have done little or no embroidery before made me feel all warm and gooey inside. Sharing something you love is so rewarding, I can't wait to do it again! 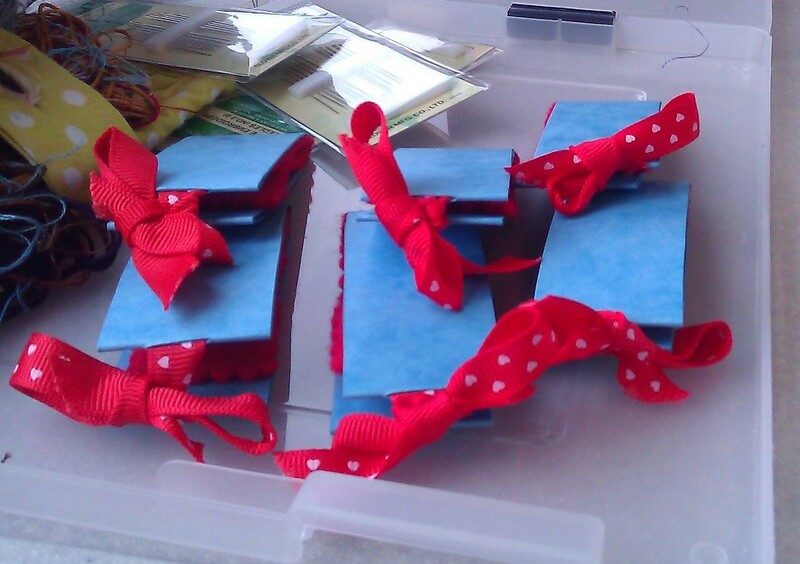 Here are some pictures of the little packs I prepared and some pictures from the evening itself. Everyone got a little bag with a hoop, needles in a needle case, and a set of instructions to take away. 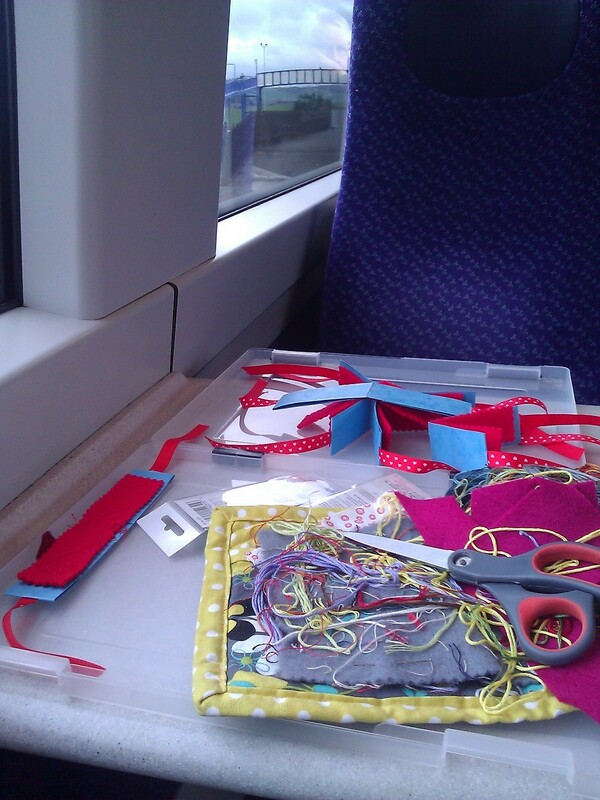 Here's me assembling the needle cases from card, ribbon and felt on the train to work! Some of the lovely ladies who attended. Well done everyone! Look how well they did! The embroideries are really starting to come to life here! 1.Blogging helps me create. This has big a big eye opener for me. I've always been a person who needs a deadline or serious external motivation to create and complete, and having this blog has certainly done this for me. In trying to do a weekly update, I always need something to talk about, so I need to make something to talk about. Certainly for the first half of the year I felt the blog was making me create. Now, a year in, this has changed, and I find when I sit down the blog I have lots and lots to talk about! For me anyway, blogging = motivation and inspiration, = more blogging = more motivation and inspiration etc. etc! 2.People are lovely. Generally, in blog and craft land, people really are lovely. I've had such lovely comments on this blog, and have now met so many people through crafting, blogging and craft fairs that I know if I need help or advice, there's someone friendly I can text or email. Thanks everyone! 3.I have discovered my true crafty love - embroidery. When I started this blog, I was dipping my toes into the world of embroidery, while my main focus was on machine sewing. Slowly, embroidery started to creep more and more into my work, and the machine sewing became the bit I did to pull the embroidery together. Now, much of my time is spent with thread, needle and hoop, exploring stitches, colours and making my own designs. It is a wonderful feeling to have discovered something I am so passionate about, that still has so much to teach me, and so many avenues to explore. To think I have gone from trying out embroidery to teaching an embroidery workshop in a year is amazing! What will next year bring? Well, an anniversary or other blog celebration wouldn't be the same without a giveaway would it? I have a small but wonderful and much appreciated band of followers, and I would love to give a little something back. So if you leave a comment on this post you can win the following. 1. A lovely book called 'Super cute'. I picked up two of these recently, thinking one would be perfect for a giveaway. It's a cute little book full of adorable little sewing projects. One of the cute projects you can make! The book even comes with needles and ribbon! 2. Hedgehog pattern! One of my hedgehog patterns leftover from my workshop, already pre-marked on calico and ready to sew, and I'll throw in some floss too! Sew the little fella above! 3. A little kitty keyring. Cute little cat who is dreaming of a belly full of fish! Nom! To enter my little giveaway, all you have to do is leave a comment! any comment will do, even 'GIVE ME THE BOOK!!!' is fine! Closing date for the giveaway is next Sunday the 8th of April. Woah...is it April already???....WOAH. I agree i have also met some lovely people through my blog too. I have the "super cute" book and seeing your post has made me rememeber a project i was going to make. Thank you. I'd love to be entered for the giveaway, please.